Know throughout the west as the voice behind the Blue Sage Band, Mike Iverson is recognized worldwide for his contributions advancing the art of clawhammer banjo. This unusual banjo technique is going through a renaissance as players everywhere are starting to realize it's potential. 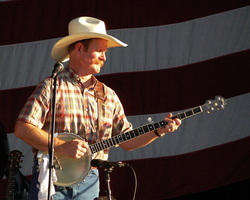 Mike is one of the leading figures in this "progressive clawhammer" movement and has received accolades as an arranger, instructor, author, and as the creator of one of the most popular clawhammer banjo websites.